Brad DeLong reproduces a memo from Obama campaign econ. policy director Jason Furman. In it, Furman discusses the latest Tax Policy Center report on the true costs and beneficiaries of the Obama and the McCain tax plans. The two candidates’ tax plans would have sharply different distributional effects. Senator McCain’s tax cuts would primarily benefit those with very high incomes, almost all of whom would receive large tax cuts that would, on average, raise their after-tax incomes by more than twice the average for all households. Many fewer households at the bottom of the income distribution would get tax cuts and those tax cuts would be small as a share of after-tax income. In marked contrast, Senator Obama offers much larger tax breaks to low- and middle-income taxpayers and would increase taxes on high-income taxpayers. The largest tax cuts, as a share of income, would go to those at the bottom of the income distribution, while taxpayers with the highest income would see their taxes rise significantly. For extra credit and reading pleasure, see the extensive comparisons the Center made between the tax proposals as described the candidate’s advisors, and as set out in stump speeches and or campaign policy documents. The key point there, at least as the Obama campaign would have you know, (PDF here), is that there is a $2.8 trillion gap between what the McCain advisors say the GOP nominee-apparent’s plan would cost, and what the number is in what we laughingly call the real world. These are important numbers, and as important, they are not, in the last analysis subject to that much controversy. That is: while it is possible to argue a great deal about the long term economic effects of different tax policies, coming up with the immediate or even the medium term costs of different proposals is not a black art. These are what scientists call deductions. They are not quite facts, not yet. But starting from a baseline of factual knowledge — the current tax code, revenues, analysis of earlier changes in tax policy and so on — it is possible to make well grounded predictions of what would happen if each candidate were able to impose the policies they now promise. The bottom line: well, my argument that a McCain presidency will be disastrous for scientific, technological and medical research is strengthened by this latest report. With non-defense discretionary spending already squeezed by the disastrous Bush brew of tax cuts for the top brackets and an unfunded war, McCain’s proposed tax and spending priorities leave essentially nothing for such luxuries as advanced education, basic and applied research and all the rest. But the key here is that you cannot make this argument without the baseline numbers. McCain can and does say that he supports research and innovation to solve such fundamental problems as America’s energy needs. I don’t doubt that he believes it when he says it. But such commitments are meaningless, lies in fact if not in intent, given his tax and budget policies — or else his tax promises are lies. That’s what you can say when — and only then, you actually dig in the weeds of the data. In this context, TPC study offers one more valuable yardstick against which to weigh all the other commitments McCain is making. The question is will anyone (but your earnest, but rather low-profile blogger) do so? But not to snark before time, I’m waiting. This is my question: will the reporting on this story emphasize the actual differences between the two plans and the consquences? Or will it focus instead on some variant of the “McCain counters Obama’s tax sally.” That is — do the voters/audience get an account of the facts that McCain would wish to dispute, or just the dispute? Will the story make it onto the news budget at all? We’ll see. As an extra credit question, I’m wondering whether Marc Ambinder will engage this at all? He’s reproduced a lot of Scheunemann. So how about a little domestic substance from the “Reported Blog on Politics?” Will update as events warrant. 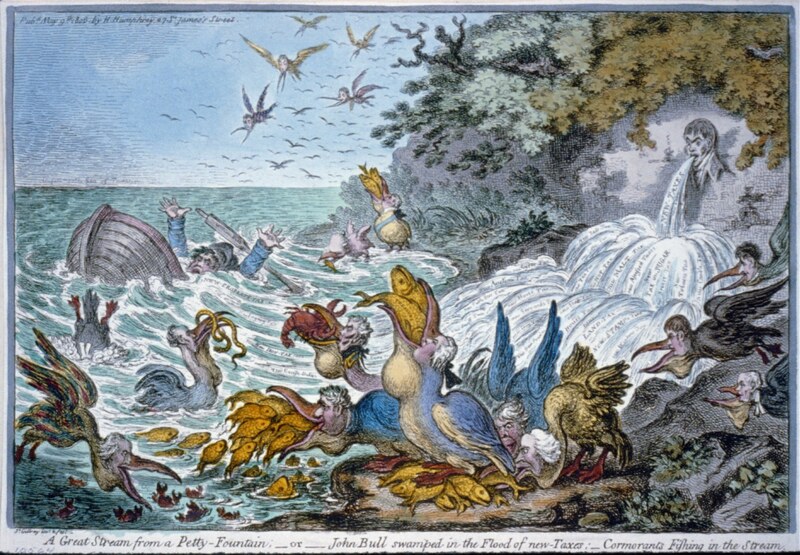 Image: James Gillray, “A great stream from a petty-fountain; or John Bull swamped in the flood of new – taxes,” hand colored etching, 1806. Source: Wikimedia Commons. Categories: Economic follies, McCain, numbers, Obama, Politics, Science Policy, Who needs science?